"Emmy" and "Emmie" redirect here. For other uses, see Emmy (disambiguation). An Emmy Award, or simply Emmy, is an American award that recognizes excellence in the television industry, and is the equivalent of an Academy Award (for film), the Tony Award (for theater), and the Grammy Award (for music). Because Emmys are given in various sectors of the American television industry, they are presented in different annual ceremonies held throughout the year. The two events that receive the most media coverage are the Primetime Emmy Awards and the Daytime Emmy Awards, which recognize outstanding work in American primetime and daytime entertainment programming, respectively. Other notable Emmy Award ceremonies are those honoring national sports programming, national news and documentary shows, national business and financial reporting, and technological and engineering achievements in television, including the Primetime Engineering Emmy Awards. Regional Emmy Awards are also presented throughout the country at various times through the year, recognizing excellence in local and statewide television. In addition, International Emmys are awarded for excellence in TV programming produced and initially aired outside the United States. Three related, but separate, organizations present the Emmy Awards: the Academy of Television Arts & Sciences (ATAS), the National Academy of Television Arts & Sciences (NATAS), and the International Academy of Television Arts and Sciences (IATAS). Each is responsible for administering a particular set of Emmy ceremonies. The Los Angeles–based Academy of Television Arts & Sciences (ATAS) established the Emmy Award as part of an image-building and public relations opportunity. The first Emmy Awards ceremony took place on January 25, 1949, at the Hollywood Athletic Club, but solely to honor shows produced and aired locally in the Los Angeles area. 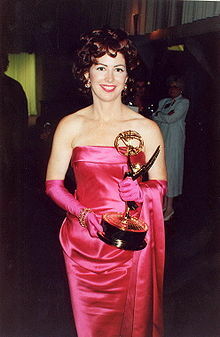 Shirley Dinsdale has the distinction of receiving the very first Emmy Award for Most Outstanding Television Personality, during that first awards ceremony. The term "Emmy" is a French alteration of the television crew slang term "Immy", the nickname for an "image orthicon", a camera tube used in TV production. In the 1950s, the ATAS expanded the Emmys into a national event, presenting the awards to shows aired nationwide on broadcast television. In 1955, the National Academy of Television Arts and Sciences (NATAS) was formed in New York City as a sister organization to serve members on the East Coast, and help to also supervise the Emmys. The NATAS also established regional chapters throughout the United States, with each one developing their own local Emmy awards show for local programming. However, the ATAS still maintained its separate regional ceremony honoring local programming in the Los Angeles Area. Originally, there was only one Emmy Awards ceremony held per year to honor shows nationally broadcast in the United States. In 1974, the first Daytime Emmy Awards ceremony was held to specifically honor achievement in national daytime programming. Other area-specific Emmy Awards ceremonies soon followed. Also, the International Emmy Awards, honoring television programs produced and initially aired outside the U.S., was established in the early 1970s. Meanwhile, all Emmys awarded prior to the emergence of these separate, area-specific ceremonies are listed along with the Primetime Emmy Awards in the ATAS's official records. In 1977, due to various conflicts, the ATAS and the NATAS agreed to split ties. However, they also agreed to share ownership of the Emmy statue and trademark, with each responsible for administering a specific set of award ceremonies. There was an exception regarding the Engineering Awards (those honoring individuals, companies, or to scientific or technical organizations in recognition of significant developments and contributions to the engineering and technological aspects of television): The NATAS continues to administer the Technology & Engineering Emmy Awards, while the ATAS holds the separate Primetime Engineering Emmy Awards. With the rise of cable television in the 1980s, cable programs first became eligible for the Primetime Emmys in 1988, and the Daytime Emmys in 1989. In 2011, the ABC Television Network cancelled the soap operas All My Children and One Life to Live, and sold the two shows' licensing rights to the production company Prospect Park so they could be continued on web television; this prompted NATAS to create a new Daytime Emmys category for the 2013 ceremony to honor such web-only series. The ATAS also began accepting original online-only web television programs in 2013. The Emmy statuette, depicting a winged woman holding an atom, was designed by television engineer Louis McManus, who used his wife as the model. The TV Academy rejected forty-seven proposals before settling on McManus's design in 1948. The statuette "has since become the symbol of the TV Academy's goal of supporting and uplifting the art and science of television: The wings represent the muse of art; the atom the electron of science." When deciding a name for the award, Academy founder Syd Cassyd originally suggested "Ike", the nickname for the television iconoscope tube. However, "Ike" was also the popular nickname of World War II hero and future U.S. President Dwight D. Eisenhower, and the Academy members wanted something unique. Finally, television engineer and the third academy president Harry Lubcke suggested the name "Immy", a term commonly used for the image orthicon tube used in the early cameras. After "Immy" was chosen, it was later feminized to Emmy to match their female statuette. Each Primetime Emmy statuette weighs six pounds, twelve-and-a-half ounces (3.08 kg), and is made of copper, nickel, silver, and gold. The statue stands 15.5 inches (39 cm) tall with a base diameter of 7.5 inches (19 cm) and weight of 88 oz (2.5 kg). The Regional Emmy Award statuette is 11.5 inches (29 cm) tall with a base diameter of 5.5 inches (14 cm) and weight of 48 oz (1.4 kg). Each takes five and a half hours to make and is handled with white gloves to prevent fingerprints. The Regional Emmy Awards are made by Society Awards, a New York-based company that also makes the Golden Globe Awards. The Primetime Emmy statues are manufactured by R.S. Owens & Company based out of Chicago, Illinois which was also charged with manufacturing the Academy Award statues until 2016 when AMPAS switched to Polich Tallix in Walden, NY. As its trademark owners, the ATAS and the NATAS hold firm rules on the use of the "Emmy" image as well as its name. For example, the Emmy statuette must always appear facing left. Any copyright notice for the statue should read "ATAS/NATAS", listing both academies. Academy members must also obtain permission to use the statue image or name for promotional uses even though they are winners of the award. Furthermore, DVDs of Emmy-winning shows may reference the fact that they received an Emmy, but cannot use the statue image unless it is capable of being removed from all copies after one year after the award is presented. The Emmys are presented in various area-specific ceremonies held annually throughout the calendar year, ranging from honoring nationally televised shows to regionally and locally produced programs. Each ceremony has its own set of award categories, nominating and voting procedures, and rules regarding voting committees. It is not uncommon for one ceremony to have some of the same category names that other Emmy ceremonies use. (e.g. Primetime Emmy for Outstanding Drama Series and Daytime Emmy Award for Outstanding Drama Series). A show that enters into one of the national Emmy competitions cannot also be entered into any of the others. For example, syndicated shows whose air times vary between media markets may be eligible for both the Daytime and Primetime Emmys, but cannot enter in both. In general, a show is considered national if it reaches more than 50 percent of U.S. households; programs that do not reach at least 50 percent of the country may enter into the Regional Emmys instead. Web television shows are treated similar to syndicated shows: they must be available for downloading or streaming by more than 50 percent of the US national market to be eligible in one of the national Emmy competitions, and they can only enter into one of those national Emmy ceremonies. Regardless of which area-specific ceremony one wins an Emmy, all winners are called an "Emmy Winner". For the most recent Primetime Emmys, held in September 2018, see 70th Primetime Emmy Awards and 70th Primetime Creative Arts Emmy Awards. The Primetime Emmys are presented in recognition of excellence in American primetime television programming. Ceremonies generally are held in mid-September, on the Sunday before the official start of the fall television season, and are currently broadcast in rotation among the ABC, CBS, NBC, and Fox networks. Some award categories presented to behind-the-scenes personnel such as art directors, costume designers, cinematographers, casting directors, and sound designers are awarded at a separate Creative Arts Emmys ceremony held a few days earlier. The Primetime Emmys are run and voted on by members of the ATAS. For most categories, members from each of the ATAS's branches vote around June to determine the nominees only in their respective categories. All members can however vote for nominations in the best program categories. The final voting to determine the winners is held in August. For the Daytime Emmys awarded in April 2018, see 45th Daytime Emmy Awards. The Daytime Emmy Awards, generally held in June, are presented in recognition of excellence in American daytime television programming. The first daytime-themed Emmy Awards were given out at the primetime ceremony in 1972, but the first separate awards show made just for daytime programming was not held until 1974. Like the Primetime Emmys, a separate Creative Arts Emmy ceremony is also held a few days earlier to honor the behind-the-scenes personnel working in daytime television. The Daytime Emmys are run and voted on by members of the NATAS. Voting is done by peer judging panels. Any active member of the NATAS who has national credits for at least two years and within the last five years is eligible to be a judge. Depending on the category, voting is done using either a ratings score criteria or a preferential scoring system. All the drama acting categories have an additional preliminary voting round called the pre-nominations, where one or two actors from each show is selected to then move on and be considered for the primary nominations for the awards. The Sports Emmy Awards are presented for excellence in sports programming. The awards ceremony takes place every Spring, usually sometime in the last two weeks in April or the first week in May, and is held on a Monday night in New York City. Voting is done by peer judging panels. The NATAS solicits anybody with significant experience in national sports production to serve as judges. The panels are organized so that they only have one representative from each corporate entity (i.e. CBS Corporation, Disney, NBCUniversal, Fox Corporation, WarnerMedia etc.) Most categories only have a single voting round using preferential scoring system. The top 5 entries in each category are announced as the nominations, and then the top entry is announced as the Emmy winner later at the awards ceremony. The News & Documentary Emmy Awards are presented for excellence in national news and documentary programming. The awards ceremony takes place every fall. Voting is done by peer judging panels. The NATAS solicits anybody with significant experience in national news or documentary reporting or production to serve as judges. Most categories have two voting rounds, with separate judging panels in each round. The top entries in each category are announced as the nominations, and then the top entry is announced as the Emmy winner later at the awards ceremony. The Primetime Engineering Emmy Awards presented by the ATAS and the Technology & Engineering Emmy Awards presented by the NATAS are two separate ceremonies that honor individuals, companies, or to scientific or technical organizations in recognition of significant developments and contributions to the engineering and technological aspects of television. Generally, the NATAS's Technology & Engineering Emmys ceremony is held in January, while the ATAS's Primetime Engineering Emmys are presented in October. Each academy has its own separate panel of highly qualified, experienced engineers in the television industry to determine their respective award recipients. Among the ATAS's Engineering Emmy Award repertoire is the Philo T. Farnsworth Corporate Achievement Award, given to honor companies who have significantly affected the state of television and broadcast engineering over a long period of time. There are 20 regional chapters located across the United States that each conduct regional awards to recognize excellence in all the regional television markets, including state to state programming as well as local news and locally produced shows. Nineteen of the regional chapters are affiliated with the NATAS, while the Los Angeles-based ATAS acts as the regional chapter serving the Los Angeles area. In general, a show is considered regional if it does not reach more than 50 percent of U.S. households; programs that reach more than 50 percent of the country must enter into one of the national Emmy competitions instead. The Regional Emmys are essential in helping NATAS and ATAS honor the works of deserving individuals in local TV through a regional outreach. Like the national awards, each region goes through their own rigorous nomination and voting procedures. Committees are formed to review entries for eligibility and high standards. Once accepted, each entry goes before different review committees, and their votes are cast to determine the final nominees. The final votes are then calculated by certified accounting firms within each region. Regardless of winning on a national or regional level, all recipients are Emmy Award winners. Originally, each Regional Emmy Awards ceremony primarily focused on only honoring individuals in local news programming. The regionals have since been expanded to encompass all locally and state to state-produced shows that receive less than fifty percent of the country's viewing audience. Maryland / National Capitol/Chesapeake Bay Maryland, Virginia, and Washington, D.C.
For the International Emmys, held in November 2018, see 46th International Emmy Awards. The International Emmy Awards recognizes excellence in TV programming that is produced initially outside the United States. They have been presented annually since 1973 by International Academy of Television Arts and Sciences. The award ceremony generally takes place in November in New York City. Any non-U.S. organization or individual (i.e. a network, a local or regional television station, producer, director, or writer) may submit a program (unless the show qualifies for the Non-English Language U.S. Primetime Program categories). Organizations or individuals who do not hold copyright ownership of a program must obtain consent from the rights owner before presenting a submission. This process is independent from membership. The College Television Awards are presented in recognition of excellence in college student-produced works. Students nationwide can submit productions and receive recognition in such categories as Comedy, Documentary, Drama, Music, Newscasts, and Series. Entries are first judged by members of the ATAS specializing in each respective field. Winners are then selected by Blue Ribbon Panels. Any work submitted must include a form signed from a faculty advisor to verify that it was produced for a school related group, project, or class. Public Service—for public service announcements and programming to "advance the common good"
The Bob Hope Humanitarian Award, awarded by the ATAS Board of Governors to an individual in the industry whose humanitarian work have a lasting impact on society. The Governors Award, the highest award presented by the ATAS, honors the achievements of an individual, company or organization whose works stand out with the immediacy of current achievement. ^ "BBC Learning English | Emmy awards". Bbc.co.uk. September 17, 2007. Retrieved February 23, 2013. ^ "Awards". Academy of Television Arts & Sciences. Archived from the original on September 14, 2008. Retrieved June 21, 2008. ^ a b c d e f g "A History of Emmy – The 1940s". Academy of Television Arts & Sciences. Retrieved January 24, 2017. ^ "Advanced Primetime Awards Search". Academy of Television Arts & Sciences. Retrieved June 27, 2008. ^ "Cable Executives Pleased Over Shot at Emmys". Los Angeles Times. July 15, 1988. Retrieved September 22, 2015. ^ "NATAS Hopes to Make 40th Daytime Emmys a Winner". broadcastingcable.com. December 24, 2012. Retrieved September 22, 2015. ^ "Netflix Does Well in 2013 Primetime Emmy Nominations". The New York Times. July 18, 2013. Retrieved July 18, 2013. ^ a b c Parker, Sandra. "History of the Emmy Statuette". Academy of Television Arts and Sciences. Retrieved October 1, 2014. ^ Award, Emmy. "History of the Emmy Statue". NATAS History. NATAS. Retrieved September 17, 2011. ^ Award, Emmy. "R.S. Owens Manufactures Emmy Award". R.S. Owens and Co. manufacture the Emmy Awards. Fox Chicago. Retrieved September 17, 2011. ^ Spadaro, Amanda (January 27, 2017). "Foundry seeks tax breaks in move to Walden." Times Herald-Record (Middletown, NY). Retrieved from RecordOnline.com, October 2, 2018. ^ "ATAS Copyright and Trademark Policies". ATAS. Retrieved January 23, 2018. ^ "NATAS Copyright and Trademark Policies". NATAS. Retrieved January 23, 2018. ^ "63rd Primetime Emmys Rules and Procedures" (PDF). Academy of Television Arts & Sciences. Retrieved February 29, 2012. ^ "39th Daytime Emmys Rules and Procedures". National Academy of Television Arts & Sciences. Retrieved February 29, 2012. ^ "2010 Daytime Emmy Pre-Nominations Announced". Soap Opera Digest. Archived from the original on March 25, 2010. Retrieved March 15, 2010. Those are the names put forth by each show for consideration to be nominated for the awards. ^ "33rd Sports Emmys Rules and Procedures" (PDF). National Academy of Television Arts & Sciences. Archived from the original (PDF) on December 21, 2012. Retrieved March 2, 2012. ^ "33rd News & Documentary Emmys Rules and Procedures" (PDF). National Academy of Television Arts & Sciences. Archived from the original (PDF) on December 21, 2012. Retrieved September 8, 2012. ^ "Technology and Engineering Emmy Award: Scope and Procedures". National Academy of Television Arts & Sciences. Archived from the original on July 28, 2011. Retrieved September 8, 2012. ^ "Primetime Engineering Emmy Awards". ^ "National Academy of Television Arts & Sciences: Chapters". Archived from the original on September 22, 2009. Retrieved October 6, 2009. ^ "20 years of the International Emmy Awards". thefreelibrary.com/. ^ "Frequently Asked Questions (Submissions)" (PDF). International Academy of Television Arts and Sciences. Retrieved April 5, 2017. ^ "About the College Television Awards". Academy of Television Arts & Sciences. Archived from the original on April 22, 2012. Retrieved February 2, 2014. ^ "2014 College Television Awards categories". Academy of Television Arts & Sciences. Archived from the original on February 9, 2014. Retrieved February 2, 2014. ^ "2014 College Television Awards rules". Academy of Television Arts & Sciences. Archived from the original on February 9, 2014. Retrieved February 2, 2014. ^ "George Clooney to Receive Bob Hope Humanitarian Award". Academy of Television Arts and Sciences. July 21, 2010. Retrieved July 13, 2014. ^ ATAS Board of Governors (August 6, 2007). "American Idol's "Idol Gives Back" and HBO's "The Addiction Project" Named Recipients of Television Academy's 2007 Governors Award". Academy of Television Arts and Sciences. Retrieved May 14, 2008. Wikimedia Commons has media related to Emmy Awards.